Thread by @jason_kint: "“Facebook still has questions to answer” link to unprecedented global committee hearing starting shortly. Facebook sent its lobbyist. We kno […]"
“Facebook still has questions to answer” link to unprecedented global committee hearing starting shortly. Facebook sent its lobbyist. We know questions will be precise at this point but we don’t know whether Facebook will come to answer. ICO certainly will. I’ll thread here. Long line to get in. People want answers. Press conference, which will happen in between Facebook lobbyist’s evidence and ICO Commissioner who produced damning report on Facebook, was already overbooked yesterday. Funny. I sure hope no one thinks that’s what this is really about. There is a long list of tough unanswered questions already. Some of those docs may simply add context to FB thinking at the time GSR/SCL was given grace period of a year. 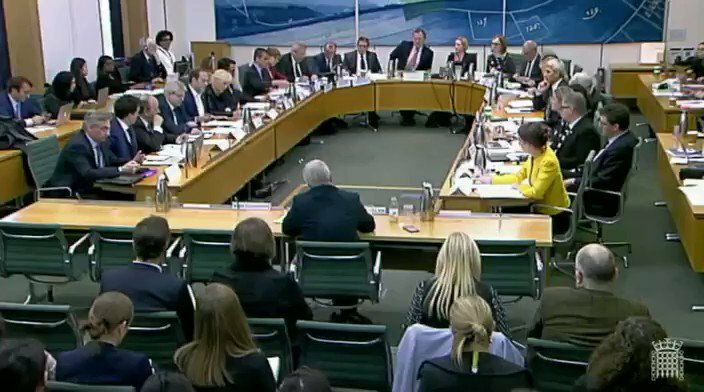 For those following in the States for first time, the UK Parliament committee is truly multiparty, they've become super well-versed on Facebook and tech over past year of hearings. @JoStevensLabour from @CommonsCMS here is sharp as a tack. starting with Canada, another Parliament who has also asked really good questions, brought in by AIQ being based in Canada among other things. looks like we'll start with a grilling why Zuckerberg refuses to show up for 6+ mos now despite having time for road tour last year. Definers already coming up in first set of questions. Pay close attention to format of hearing. They're following @CommonsCMS format which will be unusual to those in States. Chair has discretion, follow-ups allowed, much more effective in uncovering complex tech shenanigans. barely through first set of questions, we've already covered Myanmar, Definers, Zuckerberg refusing to show up, and regulation of Facebook. wow.
.@IanCLucas asking specifically when Zuckerberg found out about GSR/SCL. Facebook has been dodging questions on this for quite some time. Here is Facebook's "answer" being referenced. 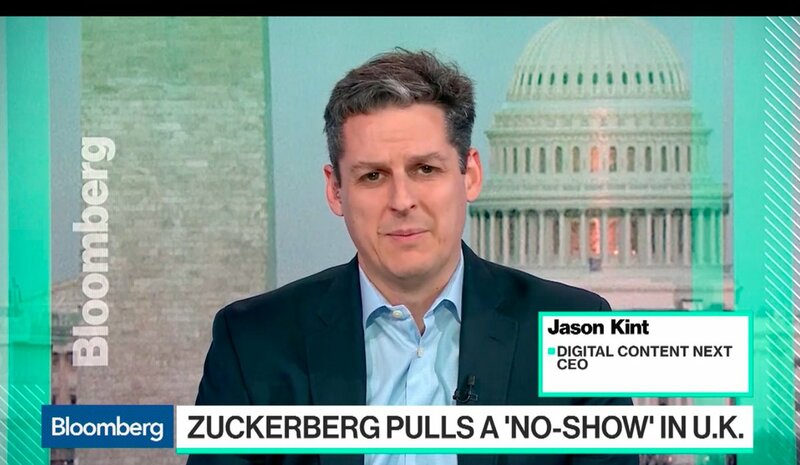 Impossible we all discussed for 2 years and Mark found out in Mar 2018.
and @IanCLucas following up on why Facebook hasn't followed up on banned apps. 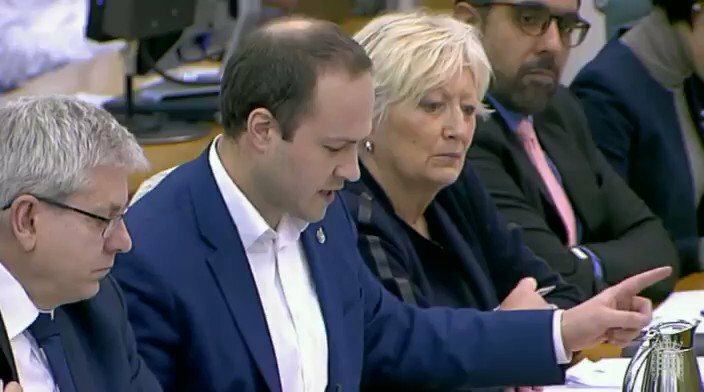 Also Lucas is asking why Joseph Chancellor was employed for nearly three years after his equal participation in the Cambridge Analytica breach. First Russia question. 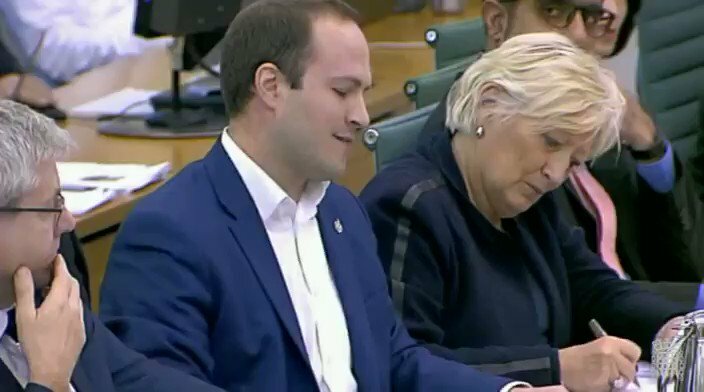 @DamianCollins asking why Facebook took so long to follow up on questions about Facebook which the recent NYT report would indicate they knew much earlier. Allan going towards talking points from comms. thought this would happen. @DamianCollins now drawing specifics from the six4three documents. He won't publish them all but he'll use them to inform questions about Facebook's prior behavior. Asking about a specific 2014 report by an engineer related to a Russian IP address. and @DamianCollins asking the fact certain developers were whitelisted and given a one-year grace period for another year. As we know from ICO report, Cambridge Analytica (SCL) helped prop up GSR since it was in this special group. GSR co-founders being Chancellor and Kogan. Allan explaining what happened with GSR again. 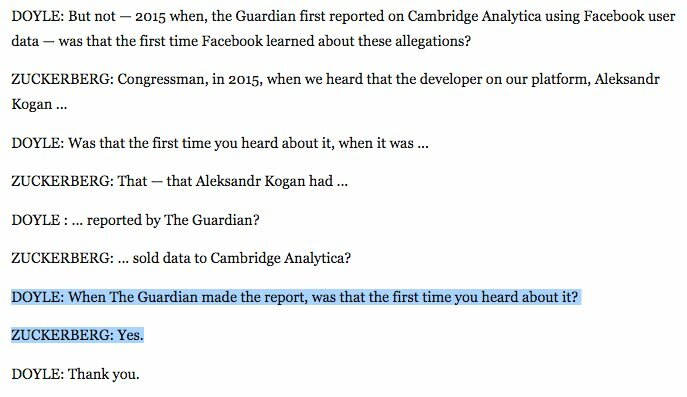 It's remarkable how Facebook continues to put 100% of the "abusive use of the data" (Facebook's words) on Aleksandr Kogan but never mention Joseph Chancellor (co-founder who Facebook hired and employed despite this). 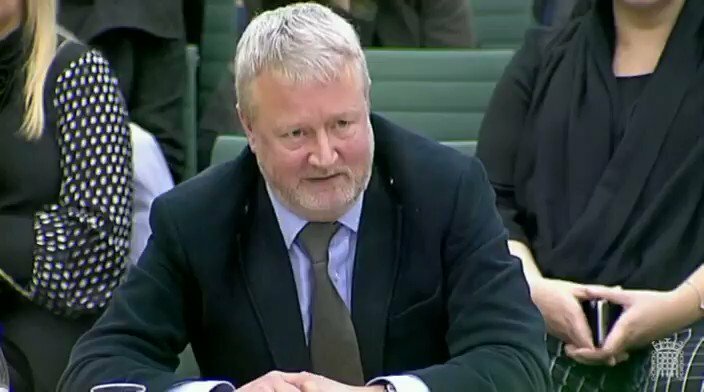 Facebook's Allan just said they don't use data from across the web, collected based on IP addresses, to target advertising. I think this answer will surprise a lot of people and require clarification and follow-up by Facebook. 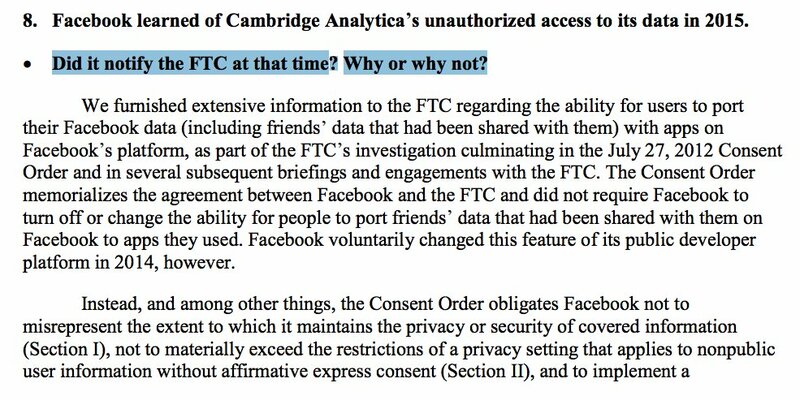 another possible misstatement Allan has made on access rights for the first version of the Faceobook API (the one that was given another one year grace period to GSR/SCL/CA among others). this frm former CTO of FTC. Facebook's Allan just stated Facebook and its tools were GDPR compliant globally. I almost just choked up my breakfast. 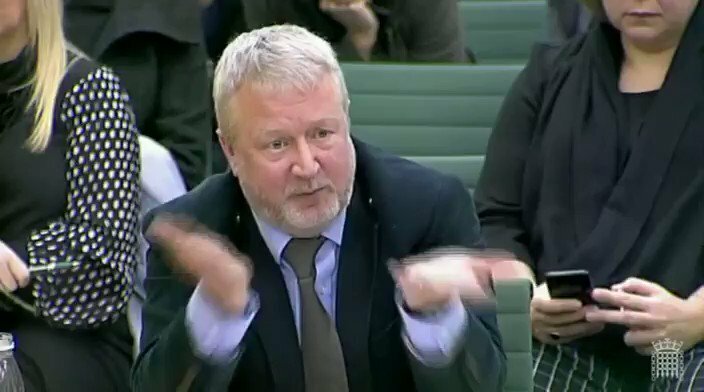 I'm still having trouble with Allan's answers to @DamianCollins (around 11:56) that user data was limited to developers even prior to 2014. My understanding was prior to the FTC settlement, there were virtually no limitations. See @ashk4n tweet here. Erskine-Smith from Canada is super savvy on the issues at hand. He's rapid-firing through questions which are all very relevant. 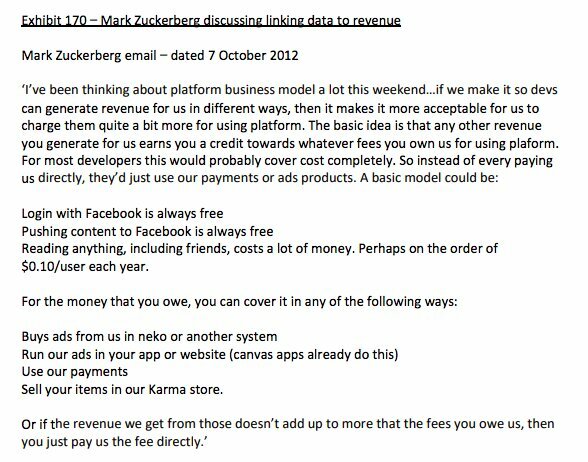 Particularly interested in questions around cancellation of access to APIs and decisioning based on advertising buying. Will need to review again. interesting way to explain the atrocity of Cambridge Analytica in numbers. Only 270 Canadians installed the app which Cambridge Analytica leveraged but a whopping 670,000 people had their data harvested because of this. now @pow_rebecca. For those watching at home for first time, this really is an all star team of representatives asking questions. a big reason is they've been asking questions and studying the issues for a long time. they also have a format to drill down on complex topics. another grilling on why the lobbyist is here giving evidence. actually a sharp, unique point on how it was decided Allan was best suited to answer all of the unanswered and deflected questions. here is @bobzimmermp, chairs the relevant Canada committee. Also super sharp (Conservative, so again noting how bipartisan both of these committees are operating on these issues to all public). 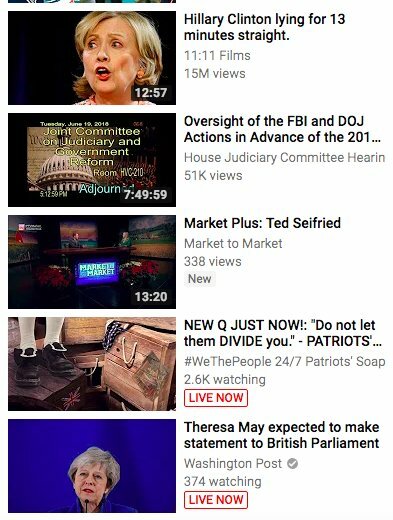 Asking whether surveillance capitalism risks democracy. wow, Allan being slightly defensive to @bobzimmermp on Zuckerberg's original terrible statement that malicious activity on Facebook was (paraphrased) immaterial to election activity. That's simply nuts at this point. Especially with Zuckerberg refusing to attend evidence session. This came up several times. More to come. Decision-making on apps matters here. It's why six4three case matters as Facebook's defense in it ironically rests on their claim to being a "publisher." Here is @carolecadwalla full thread in case you haven't found it. lots of important relays and points. 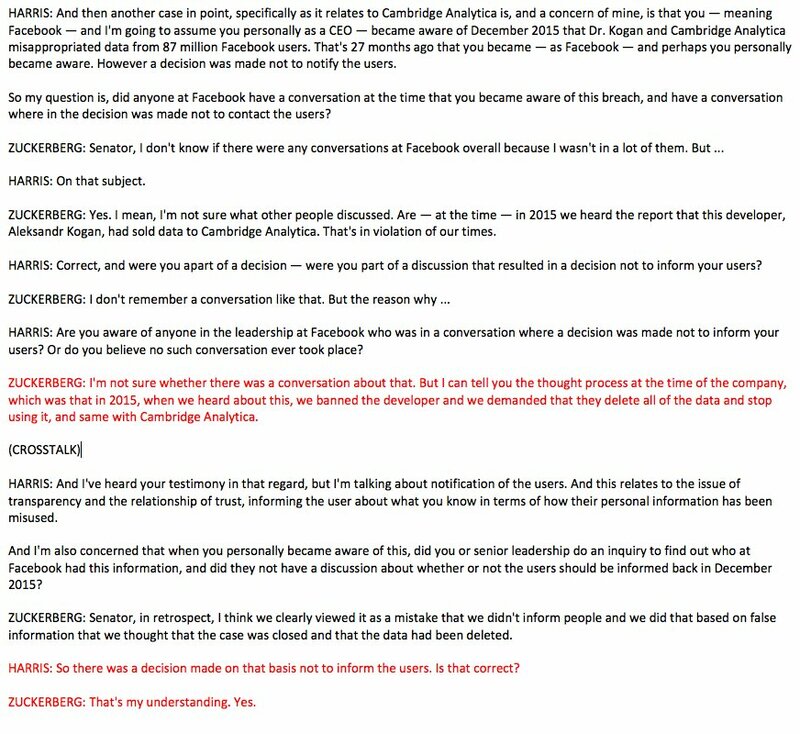 For those joining late, in the first 10 minutes savvy MP asked question he's been asking for nearly year (and so did Congress) when Zuckerberg knew about Cambridge Analytica. Answer continues to be a BS word salad suggesting March 2018. Facebook CEO Mark Zuckerberg "sent his cats" to UK, Canada, Brazil, France, Singapore, Belgium, Argentina, Ireland, Australia, Latvia. We've all learned a new term for "not showing up" in Belgium culture. Thank you, @Nelelijnen. answers to @Nelelijnen matter here around Facebook's compliance with GDPR. Facebook, despite being a global leader, is hiding behind practices of rest of web. Allan also suggested earlier they don't target ads based on web-wide data collection using IP addresses so important. They'll now go to the presser. 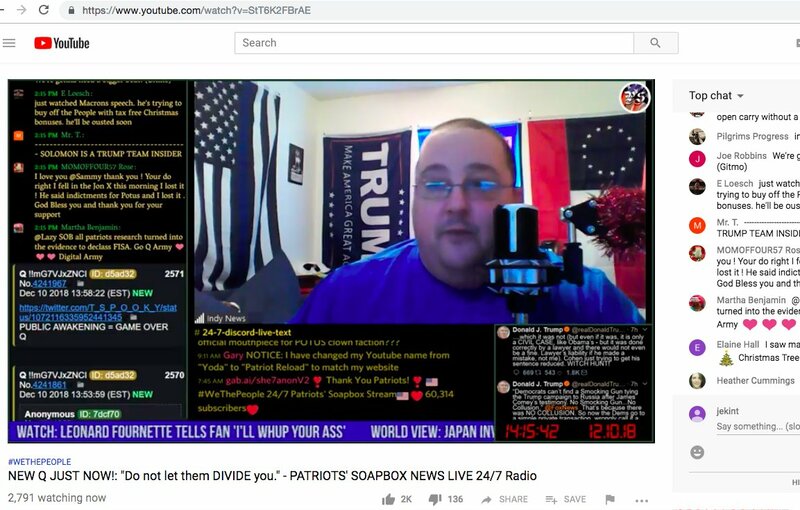 I have a few calls then will surface a few key video exchanges to help narrow the relevant discourse. It will be hard, everyone present was fabulous. Their governments and citizens should be proud despite Facebook's unacceptable dodging. Also, for those following at home, as I said yesterday, the ICO Commissioner session closing the day will be main event. also @podehaye evidence prior to it. Facebook choosing its lobbyist instantly made the first two hours a bob and weave with those who are tired of it. From presser, it sounds like @CommonsCMS still plans to publish seized documents after some debate over what really needs redaction. fascinating. In @IanCLucas questions, Facebook states it didn't take any action against Joseph Chancellor. It certainly would be nice for someone to be able to ask Chancellor questions since his equal partner was on @60Minutes and Facebook hired Chancellor. Smells ridiculous at this point. OK back on. This may be more important session. Starting with ICO Commissioner. @IanCLucas kicks if off. 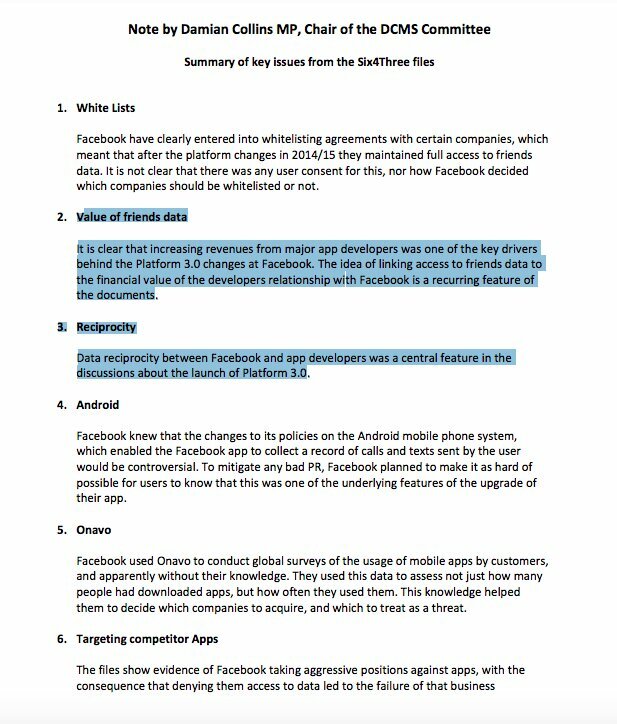 Key question from me will be what info ICO has either from Facebook or docs discovered during investigation. ICO previously indicated they have names of execs aware of CA. 👆🏽 This deserves a follow-up from someone in the room with @IanCLucas @DamianCollins @beynate @bobzimmermp. ICO should be able to answer whether any direct reports were aware of GSR/Cambridge Analytica breach. She said "senior executives" and she said 2014. Confirm this please. now @ashk4n with the fortunate circumstance of being in London today and a fluid, super sharp grand committee stops by to give evidence which contradicts several critical statements by Facebook this morning. Impressive work, @CommonsCMS. "if I were to invite one person it would be Ms. Sandberg. My understanding for these decisions, she is the one who makes the monetization calls and makes the priorities." - @ashk4n to Parliaments on Facebook sending its lobbyist and not sending its CEO. 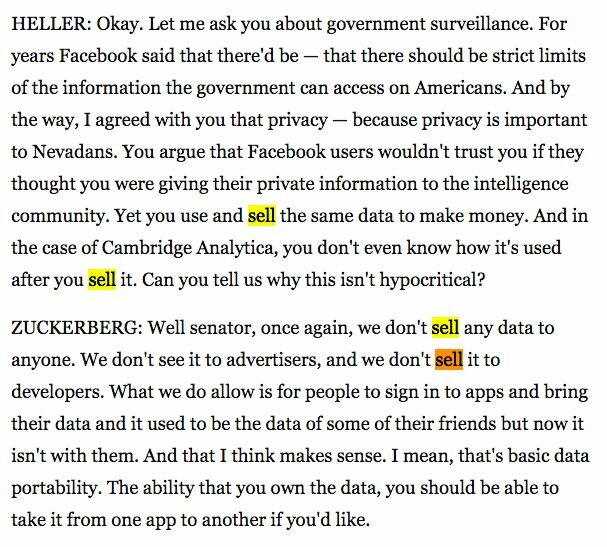 A 2nd Top 5 exchange documented here by @carolecadwalla came up several times on requiring ad spend for access to APIs/data particularly after cutoff of friends data in 2014. Remember CA/SCL couldn't get this data and propped up GSR to backdoor into it. consequence that denying them access to data led to the failure of that business." to spend on NEKO $250k a year to maintain access to the data.’"
Help me here. Would this not be selling of data? Shading is mine. There are at least dozens of (note: allegations) which will emerge from these docs. Remember, Vine? Add an allegation it lost access to the APIs based on feature threat. Should we shut it down? "MZ – ‘Yup, go for it.’"
There are at least dozens of (note: allegations) which will emerge from these docs. Remember, Vine? Add an allegation it lost access to the APIs based on feature threat. Dan Rose: (paraphrase) Should we shut it down? "MZ – ‘Yup, go for it.’"
One thing is for certain, Sir Nick Clegg will have to wait until month two to win Facebook "Employee of the Month." Dear press community, if I told you on background that I thought the Six4Three docs may be overplayed and disappointing upon release, I apologize for misleading you. I was wrong. And unbelievably, there are still significant questions even putting these docs aside. cc @DorisMatsui, reconcile these answers from Facebook CEO with the emails regarding RBC. See...go back. Details like this from Sandberg bother me. Watch her answer. 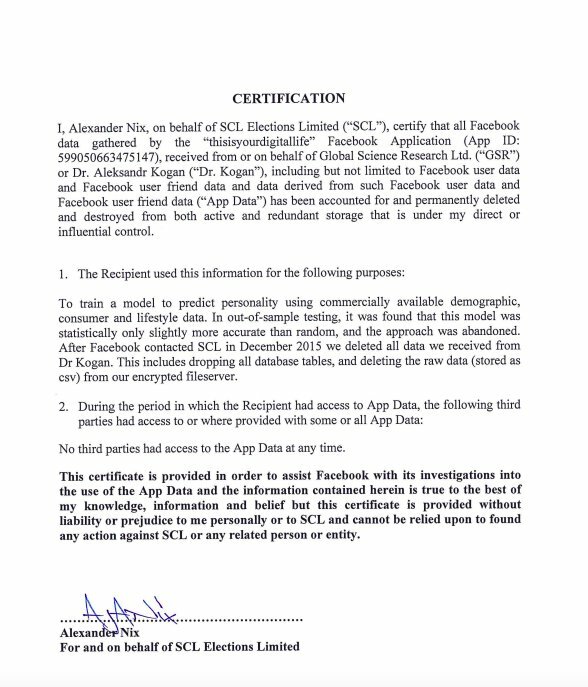 As far as we know, Facebook never got legal certification from SCL/Cambridge Analytica. They got an email and 16 months later an edited useless letter (attached) from its CEO. Good grief, you can't make this stuff up. 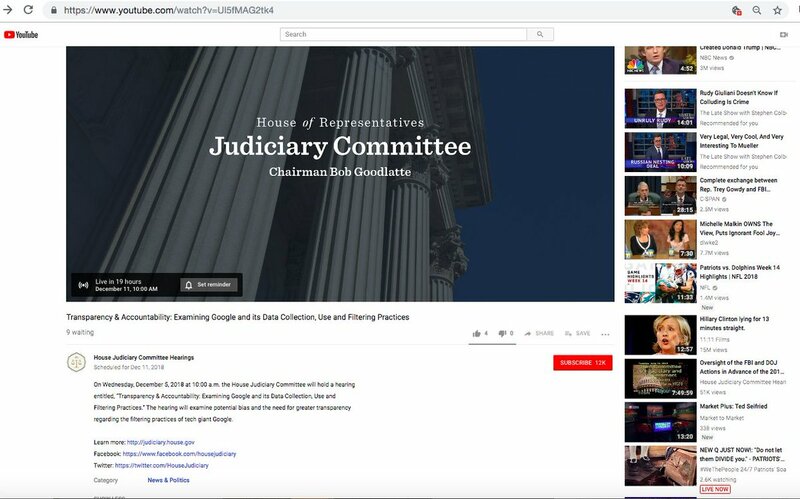 Google is currently recommending a live stream for Q conspiracy theorists, among other things, on the @HouseJudiciary Channel ( ) for tomorrow's hearing with Google's CEO Sundar Pichai. Facebook e Instagram mostrarão o tempo gasto no aplicativo! Quão viciado você acha que é? Quão viciado você é no #Facebook e no #Instagram? Os dois aplicativos vão dizer quanto tempo você gasta neles todo dia. A funcionalidade foi anunciada em 1º de agosto e ficará disponível aos usuários nas próximas semanas. Quantas horas você fica no Instagram por dia? Facebook has some really creepy plans!